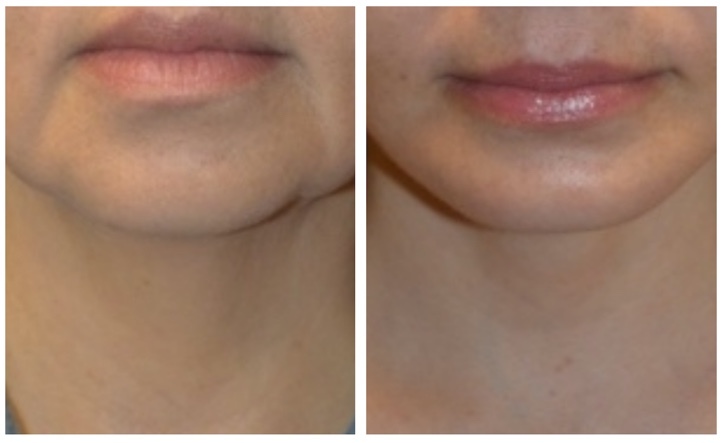 Chin implants can provide a balanced lower face, a square jawline or cleft chin. The procedure is usually performed under local anesthetic with IV sedation. While some patients have a numb sensation in their chin for up to three months, recovery typically only requires one week. Chin implants are synthetic materials that are surgically placed in the lower part of the face to enhance the appearance of the chin. Silicone implants are typically used due to their durability and their biocompatibility, which reduces the risk of complications. These implants come in a variety of sizes and shapes to help patients get the exact look that they desire. Chin implants increase the chin to provide a balanced appearance, a more pronounced square jawline, or even a cleft chin. Chin augmentation surgeries are typically performed under local anesthetics with IV sedation – usually a light sleep anesthesia – or, when combined with other procedures, general anesthesia. Patients generally just sleep through the operation and have next to no memory of it afterwards. The operation itself is a relatively straightforward procedure where the doctor first places one small incision in the skin just beneath the chin, and then inserts the implant, securing it to the jawbone to ensure stability. To complete the procedure, your doctor simply closes the incision. The results, which won’t be entirely apparent at first, will last a lifetime. The complete chin implantation procedure takes between one and two hours to perform. The incisions are placed as inconspicuously as possible – although where exactly depends on your facial structure. Some surgeons prefer to place their incisions in the mouth, aka intraorally, while others prefer under the chin, aka extraorally. There can be more complications when done intraorally, however, as the risk of infection is greater – especially if you don’t have the greatest oral hygiene regimen. That established, the benefits of going the oral route are considerable. First, even though scarring from extraoral incisions are minimal, the intraoral procedure leaves no scars whatsoever, and better, comes with the notable added benefit that these incisions heal much faster. As with any cosmetic/plastic surgery procedure, you definitely want to make sure the surgeon you choose for the task at hand is board certified. And not just any board with an official sounding name, the American Board of Plastic Surgery is the only true body that governs these things. Something else to consider when seeking the right doctor for a chin augmentation procedure is that the facial structures of men and women are different, so you’d be well advised to seek out a surgeon who has a history, a demonstrable proven track record, of performing successful facial procedures on your gender. And don’t be shy about asking them for some before and after photos either – this is your face, after all, you want to make sure you feel good about the surgeon your entrusting it to. At the same time, on their end, the surgeon you choose for the procedure will no doubt want you to be a non-smoker, in good physical health, and with realistic expectations about the results of the operation. The best thing to do in order to determine if chin augmentation makes sense for you in the first place is to arrange a consultation with a board certified plastic surgeon. The cost of the surgery will, as always, range from doctor to doctor and city to city, but should fall somewhere between $3500 and $5500. That’s not exactly cheap, but not what you could honestly label outrageous either. The recovery process from chin augmentation surgery is a fairly straightforward affair that generally lasts about a week. Most patients are able to return to work by then. Even though you’re not likely to feel any excessive pain from the procedure, your doctor will prescribe you painkillers and possibly even so-called pharmaceutical grade Arnica Montana to help reduce any swelling or bruising that occurs. And rest assured there will be some swelling and bruising around your chin and lower face. Expect it to be there for a full week following your surgery. Some patients report that their chins have felt numb for as long as three months after their operations – although this is definitely the exception to the rule. You will also likely be given a support brace to wear when you go to bed for the first few post-op weeks so your implant stays in the desired position and doesn’t start shifting around during the healing process. Even though results are immediate, because of the inevitable swelling that occurs post-op the final result of your new chin won’t be fully apparent for another three or four weeks. Finally, take note that as with any surgical procedure, there are risks involved. Although highly unlikely, there is always a chance that hematoma, seroma, numbness from nerve damage, bone erosion, and/or post-inflammatory hyperpigmentation could result from the procedure. Allergic reactions to the drugs prescribed post-op. Remember, immediately following surgery your new chin will probably look bigger, or more pronounced, than it actually is because of the aforementioned swelling. So don’t rush to judgement too quickly, give it a few months to allow everything to properly settle and heal. Plus, it usually takes people awhile to get used to the new face they’re seeing in the mirror. Your new chin might have you suddenly looking at your nose differently. It’s all connected, changing one element of your mug is going to impact the aesthetic of your entire face. Any good plastic surgeon will of course be fully aware of this inevitability and do his/her job accordingly, with the final, overall look of your face in mind. That’s just all the more reason to make sure you actually hire a “good” plastic surgeon. Your face, like any part of your body when you get right down to it, is too important to entrust to a potential hack. It’s just one more reason to do your research and make sure you hire a competent professional for the job. By ensuring you’ve chosen a board certified doctor for the job, you can proceed comfortable in the knowledge that you’re dealing with an authorized professional who knows what they’re doing.